:The books of the twelve Minor Prophets are some of the least studied by Christians today, but they contain some of the great themes of Scripture, such as God's mercy and judgment, His covenant with Israel, the day of the Lord, and the coming of the Messiah. 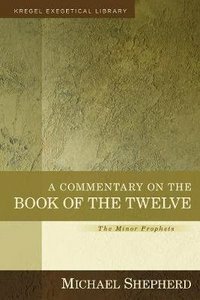 Arguing for a canonical unity that recognizes the Minor Prophets as one cohesive composition, Michael Shepherd explains the historical meaning of each verse of the twelve books and also provides guidance for application and preaching. Pastors, teachers, and serious students of Scripture will find a wealth of insights for understanding the Minor Prophets. About "Commentary on the Book of the Twelve, a - the Minor Prophets (Kregel Exegetical Library Series)"
For thousands of years, the Book of Psalms has been one of God's people's richest resources for expression of worship and development of the spiritual life. At the same time it is one of the more complex and challenging sections of the Bible for expositors. Pastors, teachers, and all serious students of the Bible will find this commentary invaluable for developing their understanding of the Psalms and for improving their ability to expound it with precision and depth. Textual issues: Every major textual difficulty is addressed in order to help the expositor understand the interpretive issues and make decisions when there are multiple available readings. Poetic language: The Psalms are full of poetic imagery, devices and structures. Ross discusses this "language" of Hebrew poetry in its context with each psalm, specifying the precise devices being used and how they work in the psalm. The Psalms' Hebrew grammar and syntax pose a challenge to many expositors, whether they are familiar with Hebrew or not. This commentary illuminates Hebrew constructions word meanings in a way that is helpful both to readers who are comfortable with Hebrew and those who are not.